Mannaz is the half-month stave through 29 April. Ingwaz is the intuitive rune, and Ansuz indicates Tree’s message to us. Read right to left is Mannaz, Ingwaz reversed, then Ansuz. Ehwaz has led us through deep exploration of where we need to examine life at a spiritual level. It may have been very specific or general, though its steadfastness to put us in the midst at that level and to get the skills to cope there is clear. Moving into Mannaz this week, we are greeted by the need to bring what we’ve learned to community. 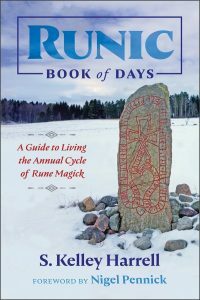 In Runic Book of Days I talk about Mannaz as the animistic rune. I’ve said a hundred times, we could say that about all of them, because they source from a time that life was more animistic. 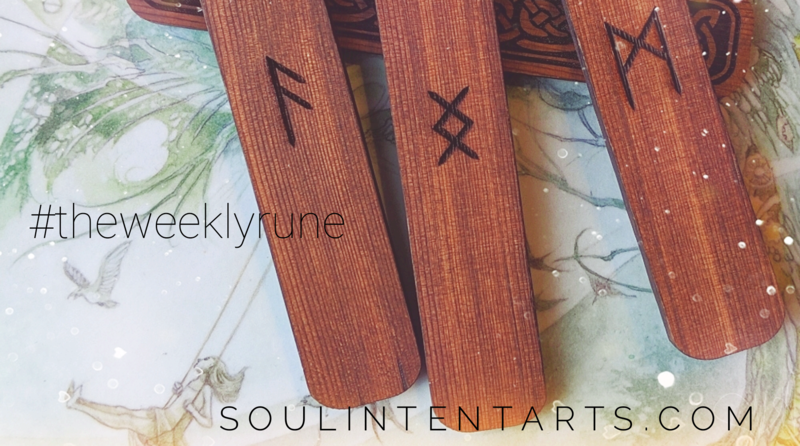 We’d already begun to pull away from it by the time the runes were en vogue, yet dregs of it were still lived. If I were writing the book now, I’d express that differently. We do indeed live and learn, and we evolve. What I’d say now is more along the lines of Ehwaz is the animistic rune, and Mannaz is the one that demands we do something with it. Curious that last week Mannaz reversed appeared as the complementary rune. In that role, it encouraged us to cope with our Ehwazian spiritual findings on our own and not to expect much support for them–internally or externally. Having made what progress we did with that, this week with Mannaz center stage, it’s time for that spiritual wisdom’s debut. A nuance of Mannaz that’s interesting is it urges us to bring our shiny, new spiritual truth to new communities, not existing ones. Those of us who dwell in social and personal circles that allow us to grow are so very fortunate. They are not the norm. Even if that’s the case, this week, go with the currents of Mannaz and seek out new community for support. It may just be that trusting such a leap of faith is actually part of how we hold space for ourselves. Ingwaz supports the half-month rune by affirming that this stretch into new social groups feeds the sacred seed. Beginning with Isa, Ingwaz is the culmination of a long evolution which, we will conclude in a couple of months, when Isa is the half-month rune. Its current emphasis is that substitutes and half-hearted efforts won’t work. I mean, deep down we know that about everything, yes? Junk in receives junk out. Where Ingwaz doubles down on that truth is by highlighting where we might be sabotaging our sacred seed. Whether consciously or unconsciously, how we treat it sets up a pattern that continues to spiral into other life areas. Not to be pedantic in the seed analogy, but it grows. If managed poorly, it doesn’t just stay this isolated bad seed. It roots and reaches into every aspect of ourselves and our life. Likewise, when we tend it regularly, it extends as a positive force through our lives. Ansuz gives overall insight again this week, though from the voice of Trees. This is a new voice in TWR, and I was thrilled to engage it. Trees indicated that in our higher states of being, there’s nothing but truth. Whatever the abruption that is the source of lies, it just doesn’t exist at that level. This isn’t Pollyanna or love-n-light stuff, but sheer science. Nature doesn’t lie. It finds the most optimific path to progress along, and it does so. And ‘lie’ may be too human a term. It’s not about intentional deception or manipulation. Rather, it’s about energy always seeking its best and most supportive path. Humans skills in doing anything other are mental (Mannaz), which makes them terminally human. The caution from Trees is be careful what we do with our Mannaz. Yes, it’s about new social groups, and specifically the motivation to go out and engage them. It’s also about how we use our mental states, our intellect. They are one of the most innovative aspects of human evolution. This week we’re asked to be mindful (see what I did there) of that evolution, and to use it well.